Registrar of Cooperative Societies, Assam. 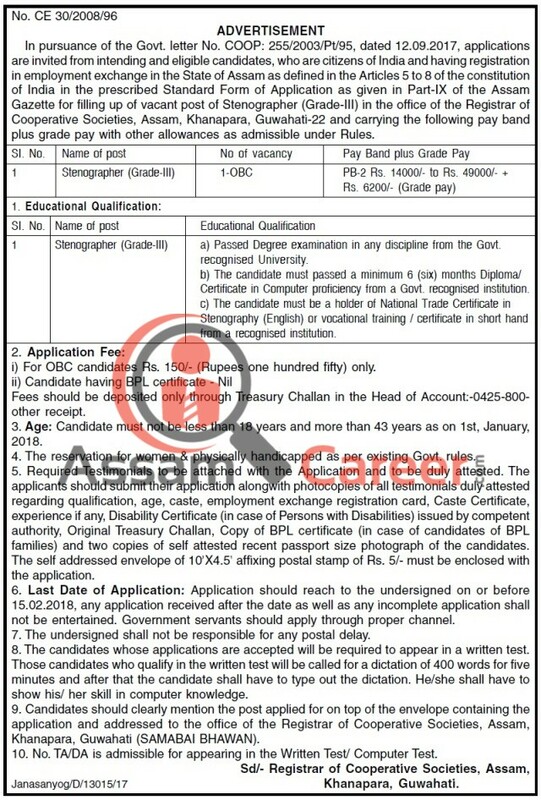 Assam Gazette for filling up of vacant post of Stenographer (Grade-III) in the office of the Registrar of Cooperative Societies, Assam, Khanapara, Guwahati-22 and carrying the following pay band plus grade pay with other allowances as admissible under Rules. a) Passed Degree examination in any discipline from the Govt. recognised University. b) The candidate must passed a minimum 6 (six) months Diploma/ Certificate in Computer proficiency from a Govt. recognised institution. i) For OBC candidates Rs. 150/- (Rupees one hundred fifty) only. ii) Candidate having BPL certificate - Nil Fees should be deposited only through Treasury Challan in the Head of Account:-0425-800- other receipt. Age: Candidate must not be less than 18 years and more than 43 years as on 1st, January, 2018. The reservation for women & physically handicapped as per existing Govt. rules. Selection Process: The candidates whose applications are accepted will be required to appear in a written test. Those candidates who qualify in the written test will be called for a dictation of 400 words for five minutes and after that the candidate shall have to type out the dictation. He/she shall have to show his/ her skill in computer knowledge. How to apply: Required Testimonials to be attached with the Application and to be duly attested. The applicants should submit their application alongwith photocopies of all testimonials duly attested regarding qualification, age, caste, employment exchange registration card, Caste Certificate, experience if any, Disability Certificate (in case of Persons with Disabilities) issued by competent authority, Original Treasury Challan, Copy of BPL certificate (in case of candidates of BPL families) and two copies of self attested recent passport size photograph of the candidates. The self addressed envelope of 10’X4.5' affixing postal stamp of Rs. 5/- must be enclosed with the application. Application should reach to the Registrar of Cooperative Societies, Assam on or before 15.02.2018, any application received after the date as well as any incomplete application shall not be entertained. Government servants should apply through proper channel. Candidates should clearly mention the post applied for on top of the envelope containing the application and addressed to the office of the Registrar of Cooperative Societies, Assam, Khanapara, Guwahati (SAMABAI BHAWAN).